Create buzz around playtime with this educational spin on bingo. The same child who scurries away at the first sign of an educational toy will have so much fun playing that they won't even notice that they're learning the difference between bugs. Here, traditional bingo numbers surface as 42 colorful insect illustrations, ranging from the brilliant harlequin bug, to creepy crawlers like the spittlebug. To play, place the included plastic chips onto one of the 6 sturdy picture boards as the insect cards are drawn--each revealing informative details about the species. Eager minds will love winning the game, but the real prize is the knowledge they take away. Made in USA. 12" L X 9" W; Game Pieces: 1" dia. Accommodates 2-6 players. Recommended for ages 3-11+. Bug Bingo has been discontinued. When it sells out, it will no longer be available. The real deal and ever so interesting! 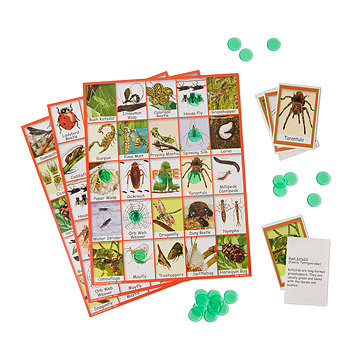 Create buzz around playtime with Bug Bingo, an educational spin on the traditional game..